XBOSoft offers a unique blend of software testing expertise in development methodologies from waterfall to hybrid to Agile. Our depth of hands-on experience in a variety of industries gives us the ability to tailor and optimize Agile to each client’s specific needs. Static, cumbersome software is no longer an option for competitive companies; it’s critical to develop processes that quickly iterate new code and release new features while simultaneously ensuring high quality. 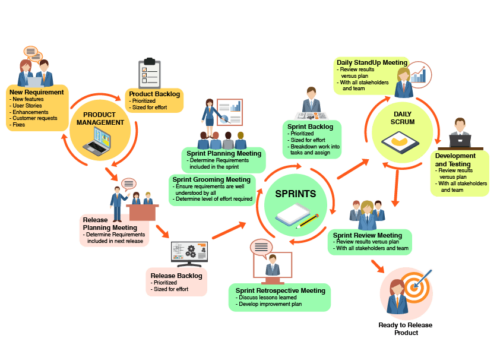 As a result, many companies have turned to Agile development methodology, which focuses on fast iterations and constant evaluation to produce flexible, robust and stable software. But understanding the value of Agile doesn’t guarantee easy adoption — adapting traditional QA processes to an Agile environment is not something you learn from a book, but a skill and culture developed through experience. Teams converting to agile have challenges not only in adapting processes and thinking differently, but also behaving differently. XBOSoft offers a unique blend of software testing expertise in development methodologies from waterfall to hybrid to Agile. Our depth of hands-on experience in a variety of industries gives us the ability to tailor and optimize an Agile testing process to each client’s specific needs. In traditional software development project life cycles, test plans play a very important role. In the initial phase of the project, the testing team sits together and puts together a test strategy while discussing the testing scope based on the requirements specification to ensure that all critical features mentioned in the specification will be tested. They then discuss who tests what and the timing of each test phase alongside development. The output of this process is the test plan. In terms of quality assurance and testing, what changes when migrating from a traditional development workflow to Agile? Rather than a detailed plan that explains step by step what to do and who should do it, Agile sets forth a direction with a compass and ways to work with the compass (users and product owners) so you get to where you need to go. In Agile, some waterfall activities are reduced while some get larger, expand, change, and/or move to a new order in the QA process. Most important, you need to be agile about being Agile. Adapt to bumps in the road and the context of your project and organization. Critical to this process is the Agile testing life cycle. To ensure you’re producing the highest-quality software possible, testing cannot be confined to a standard approach. Instead, it must be an ongoing effort that adapts to each unique Agile project. People: High-quality software starts with high-quality people working in an environment that supports their growth and adaptation to Agile. Process: Agile means being agile. Every organization needs to implement their own version of Agile depending on their software, structure and culture. Product: A working product delivered in short iterations enables feedback and quick adaptation. This is the ultimate key to success. User: Users are king. Deliver and then listen to what they say. We understand the QA challenges that can arise when implementing testing in an Agile environment: Communication on larger-scale Agile projects with globally distributed teams; incorporating risk planning and avoidance; accounting for management loss of controlling time and budget; maintaining flexibility versus planning; and not getting side-tracked by speed of delivery over quality software. Using a collaborative network-based approach, XBOSoft defines clear, shared goals and objectives across all teams both internally and client-side for improved velocity, quality software, and customer user satisfaction — resulting in stakeholder buy-in for metrics that matter. Contact us today for more information on XBOSoft services that can apply to an Agile testing methodology.